Yes, you guessed it right, this is the all new Mercedes-Benz A-Class. 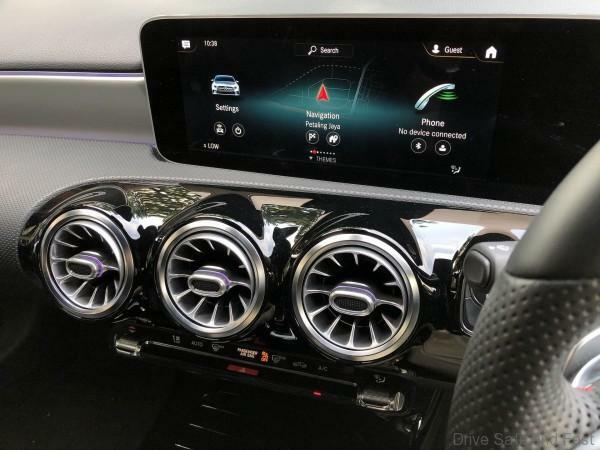 Technologically the new A-Class not only takes first place thanks to MBUX – Mercedes-Benz User Experience: it also offers a number of functions that were previously the preserve of the luxury class. 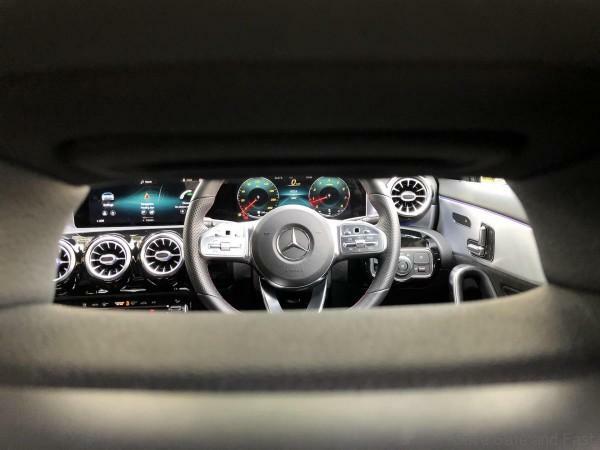 But here we are looking at the cabin of this new A-Class which is feature filled like no other car manufacturer and it is an object of pure desire for car photographers. The interior of the new A-Class iscompletely redefined with its modern, avant-garde look. Mercedes-Benz has takena completely new approach, revolutionising the compact class from the insidewith a new feeling of spaciousness. 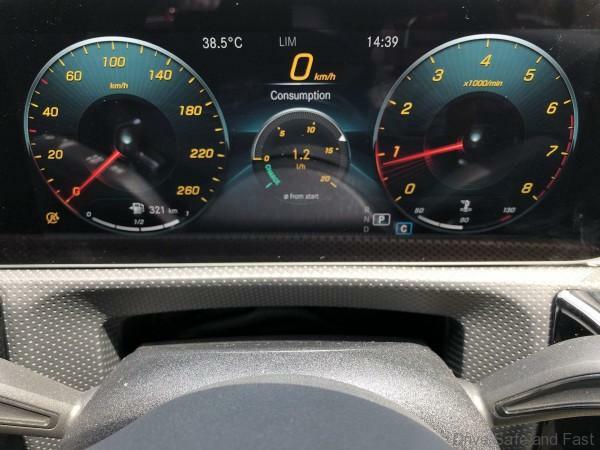 The unique interior architecture is shapedin particular by the avant-garde design of the dashboard: For the first time acowl above the cockpit has been completely dispensed with. 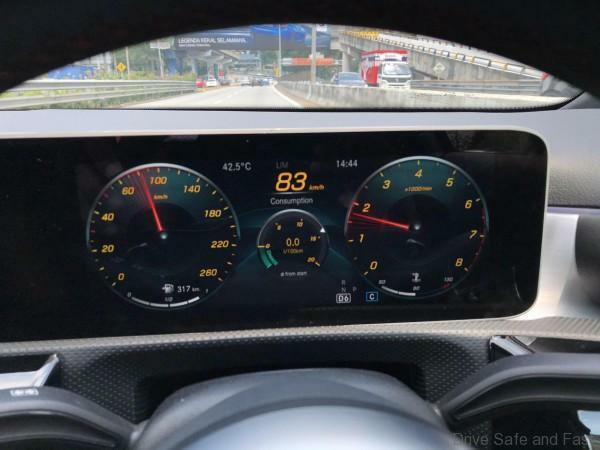 As a result, thewing-shaped main body of the dashboard extends from one front door to the otherwith no visual discontinuity. The Widescreen display is completelyfree-standing. 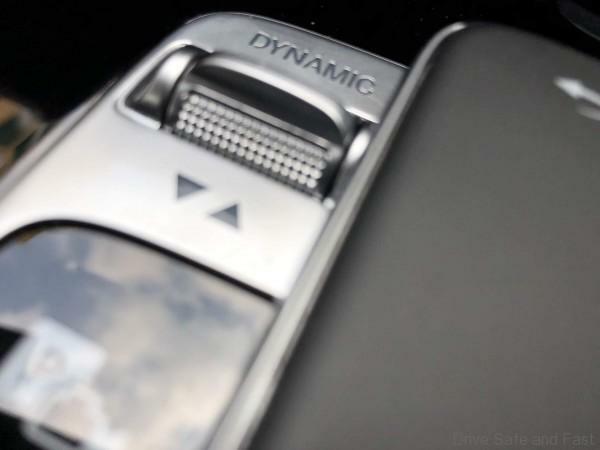 The air vents in a sporty turbine-look are another highlight. 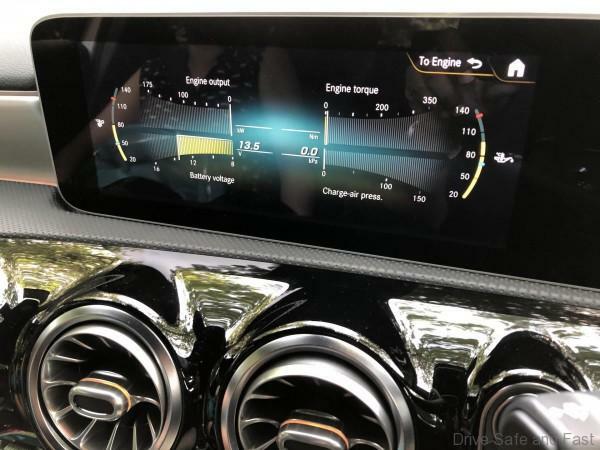 The interior architecture and the control& display systems of the new A-Class are an avant-garde USP in thissegment. 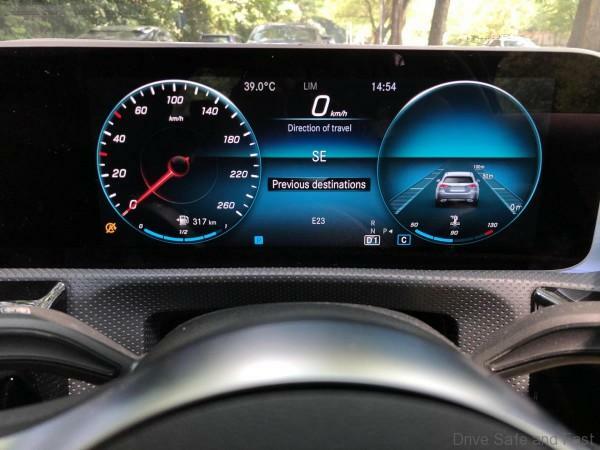 The dashboard is divided into two three-dimensional, horizontalsections: the lower section is visually separated from the main body of thedashboard by a “trench”, and it appears to float in front of thedashboard. The optional ambient lighting enhances this effect, accentuating thefree-floating impression of the substructure. 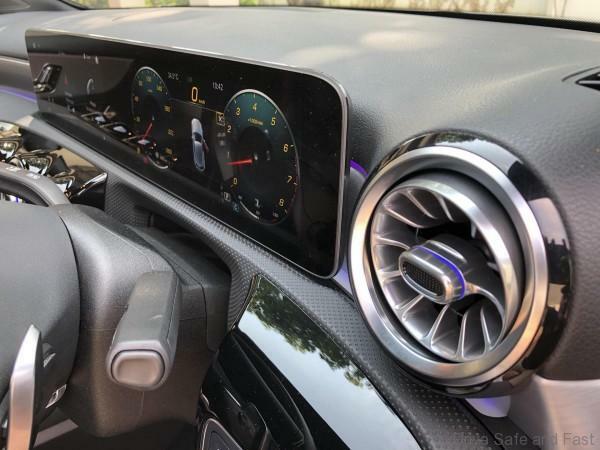 The lower section of the dashboard providesthe basis for the turbine-look air vents and the completely free-standingdisplay. Integration of the air conditioning displayinto the central screen also considerably helps to maintain the clear line ofthe cockpit. 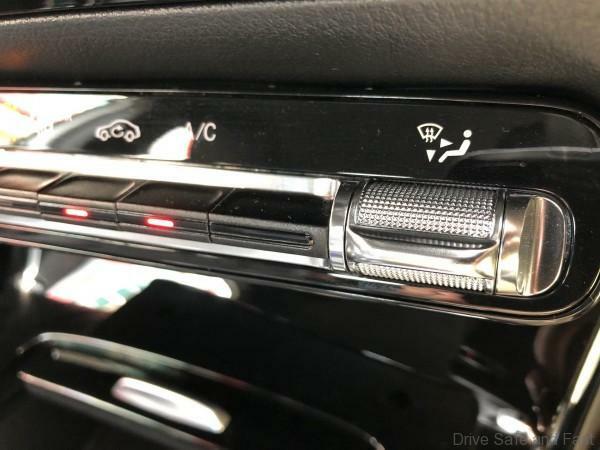 The air conditioning is controlled by the horizontal rockerswitches of via the corresponding touchscreen menu. 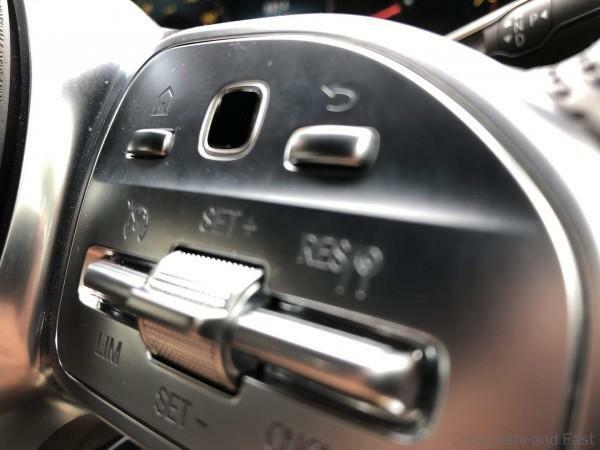 Thanks to the omission of a cockpit cowl,the main body of the dashboard with its trim extends from one door to the otherbehind the seemingly free-floating Widescreen. 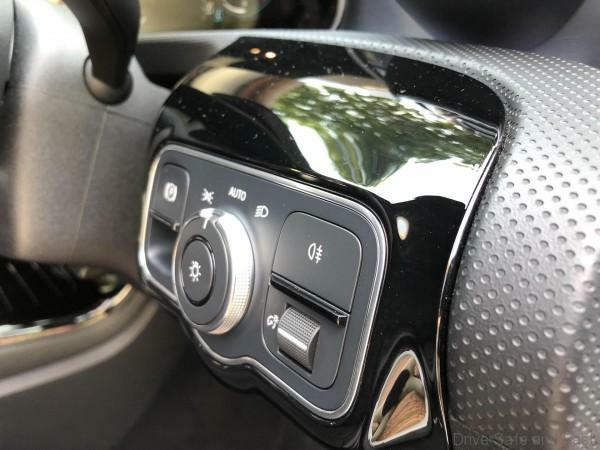 The optional trim elements arein a “wrap-around” design, and the choice of materials (e.g.open-pore wood) underlines the progressive, modern positioning as the topinterior in this class. The five round air vents have a new turbinelook inspired by the world of aviation. Finely designed air vanes in aconcentric arrangement create the impression of a jet aircraft turbine. In theStyle equipment line the vent surround is colour-accentuated at the depth ofthe vent geometry, giving the impression of an afterburner. 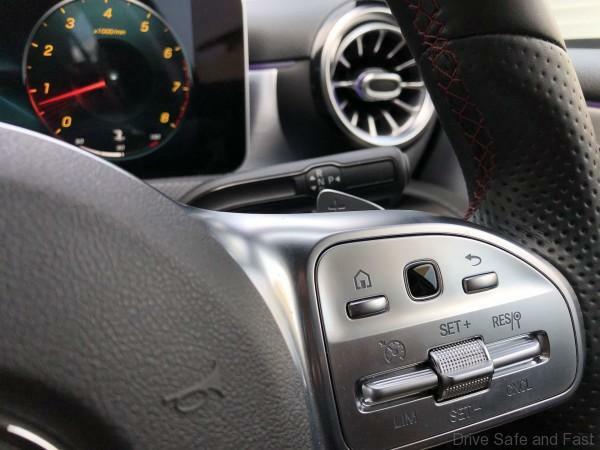 The air vents inthe middle are driver-oriented, accentuating the sportiness of the interior. The door centre panel transitionsseamlessly into the armrest, underlining the sensual, flowing design principle.The newly designed 3-spoke steering wheel, door handles, centre console andseats follow a modern design idiom. The ring-shaped, completely closedgrab/door-pull handle is of unusual design and particularly ergonomic. The interior can be adapted to suitpersonal tastes in many ways. 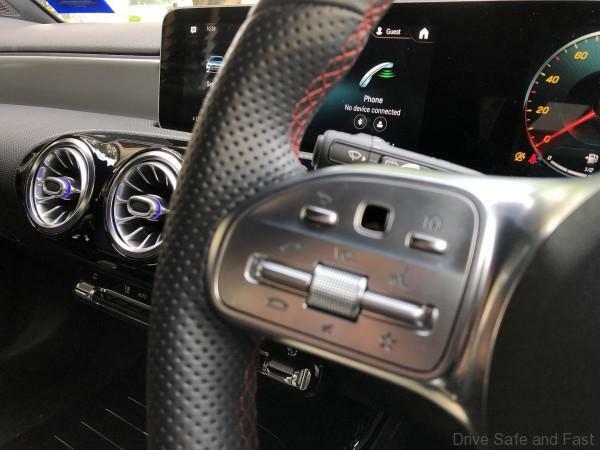 The fresh colour concept plays an important partin this: the choice includes indigo blue inspired by the denim jeans look, aswell as cool neva grey exclusive to the Mercedes-Benz A-Class. Light effectscreate an additional effect in this context. 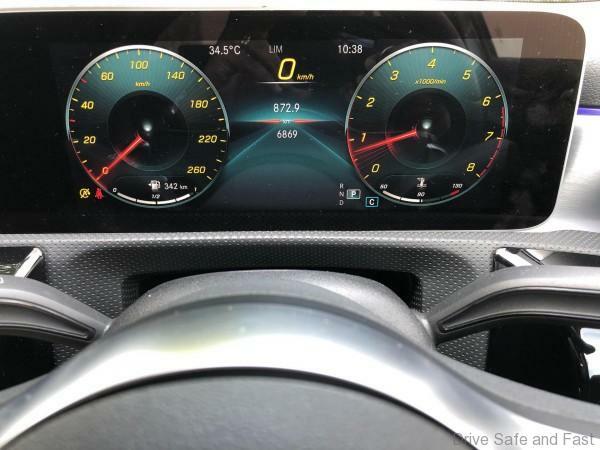 Depending on the equipment line, differenttypes and colours of trim elements are available for the dashboard. 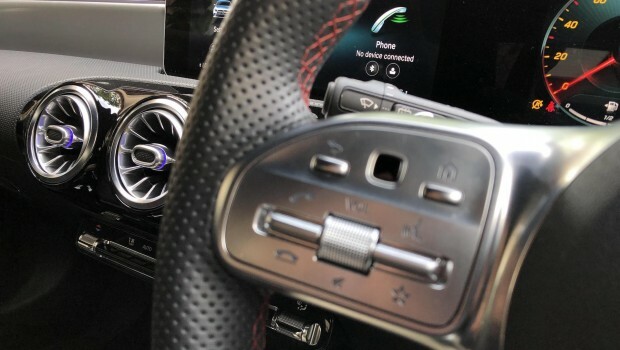 From 12 to 64 – with the generation change,five times as many colours are optionally available for the ambient lighting ofthe new A-Class. 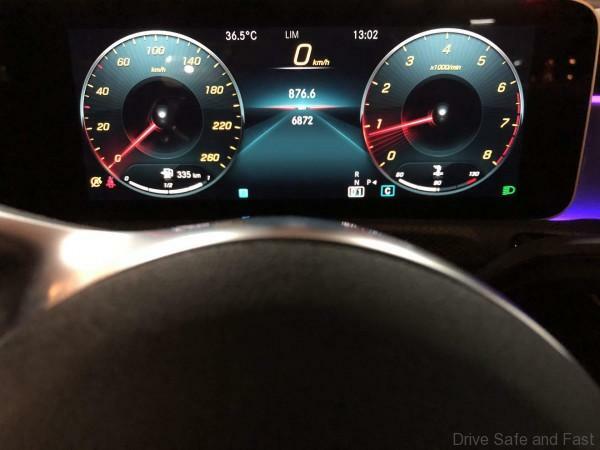 It is not just the variety that has increased, as the emotivepresentation also sets standards in this segment: the different colours arecomposed into ten colour worlds to allow an avant-garde lighting display withspectacular colour changes. The colour worlds can be matched to thedifferent styles of the widescreen display if required, creating a harmoniousoverall impression. There are also lighting effects that customers can activateindividually. 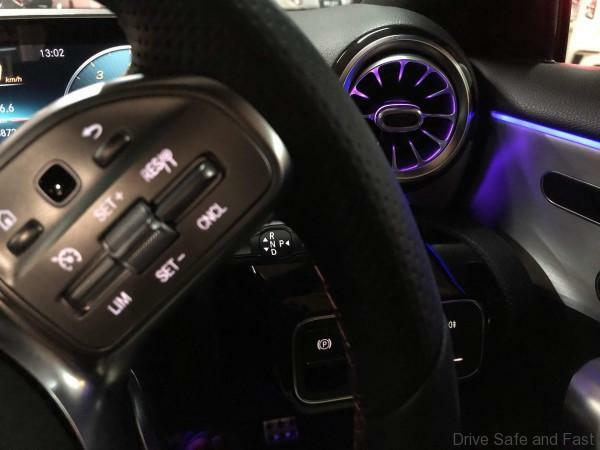 The avant-garde ambient lighting was alreadytaken into consideration in an early development phase, and systematicallyintegrated into the interior design. 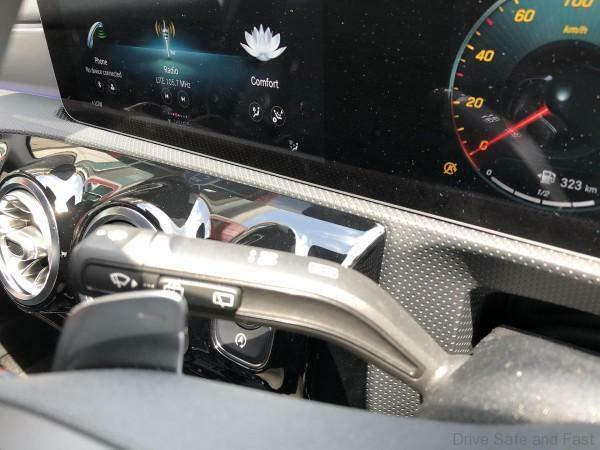 This is apparent in the area where theupper and lower sections of the dashboard come together, for example. Thanks to a combination of indirect and direct lighting, a very special ambience is created here which might be compared to the night-time illumination of a historic building. The interior of the turbine-like air vents with galvanised surfaces is likewise emotively presented by the ambient lighting. Visit a Mercedes-Benz showroom and make sure your smart phone has ample battery life and memory and start snapping away.